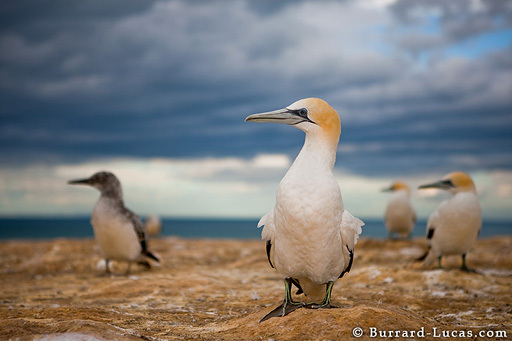 During the breeding season (from October to December), up to 6,500 pairs of Australasian gannets nest on a small stretch of New Zealand's coastline called Cape Kidnappers. At 16 weeks old, the chicks undertake an epic 2,800km journey to the Australian coastline where they go to feed in the rich waters. By March (when this photograph was taken) all that remains of the colony are the stragglers - a mixture of adults, and chicks that haven't yet fledged. In order to get an atmospheric shot showing the stormy sky, I had to ignore the guano covering the ground, get down on my stomach and slide towards the birds with a wide-angle lens!